Drinkaware.ie and Insomnia are launching a partnership aimed at helping people to change their drinking behaviours in the New Year. 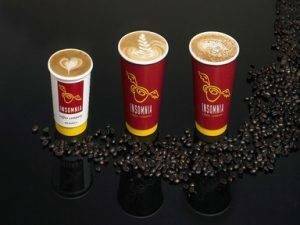 From 10 January they will be offering half-price coffees after 4pm in Insomnia outlets across Ireland – a number of which stay open outside of usual business hours – to help people pace their drinking in 2013. “January is a time when many people resolve to drink at a more moderate level,” said Fionnuala Sheehan, chief executive of Drinkaware.ie. “With this in mind, it’s also the perfect time for people to learn about pacing their drinking and the benefits of this approach. In overall terms we are drinking about a fifth less alcohol than a decade ago, and we are drinking less often than our European counterparts. The partnership will launch with an event in Insomnia’s St Stephen’s Green branch on Thursday, 10 January at 5pm. The first 200 voucher holders will be treated to a free muffin with their half-price coffee, and there will be live music as well as the chance to win an iPad on the evening. Vouchers can be downloaded from www.facebook.com/InsomniaCoffeeCo, www.facebook.com/drinkaware.ie or at www.drinkaware.ie.